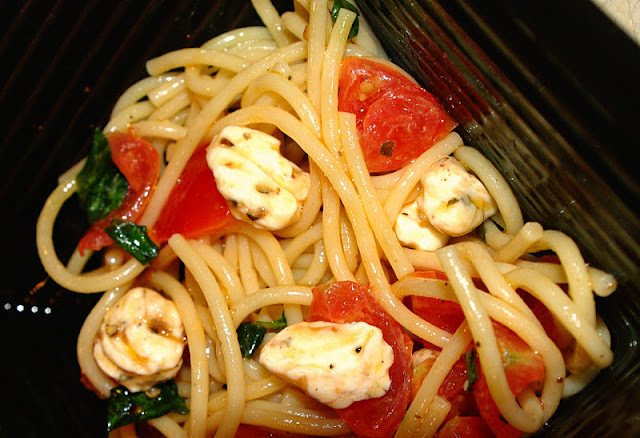 If you love caprese salad, you are going to love this pasta dish variation. It's super easy and oh so delish! This recipe is so versatile too. You can make as little as is needed for one person or you can make enough for 10 people. Tomatoes, you can use any variety you wish. Here are some guidelines, but you can adjust amount to your liking. 2 roma tomatoes, diced or 1 large regular tomato, diced or 6-8 cherry tomatoes, quartered or 10-15 grape tomatoes, halved. 1. Prepare pasta according to directions on the package. 2. While the pasta cooks, combine mozzarella, tomatoes, basil, EVOO, salt, pepper, and oregano in a large bowl. Set aside until pasta is finished. 3. Drain the pasta and add to the mozzarella and tomato mixture. Mix well. The hot pasta will melt the cheese slightly giving it an ooey gooey texture. Yum! 4. Taste and adjust seasonings accordingly. Serve. - This pasta is equally delicious when served cold. - I like the rustic appearance of the sauce, but if you prefer a smoother texture, you can puree the olive oil, basil, and seasonings in a blender. Once the desired consistency is achieved, mix in the mozzarella and tomatoes. Add pasta when finished cooking.